Bernard Roux, a member of AGTER, is an agronomist and a member of the French Academy of Agriculture. Coline Sauzion (AGTER) questions him here about the model of intensive agricultural production in the province of Almeria, located on the east coast of Andalusia. After a historical return on the conditions of development of this European vegetable export pole, the interview focuses on the characteristics of a production system based essentially on the hyper-technologization of crops and the exploitation of immigrants. Could you first describe the mains steps of the implementation of the Almeria region production model ? It all started in the 1950ies, when the Franco regime decided to develop the Almeria area, a district located in the eastern part of Andalusia, by the sea. In that time this was a practically raw plain area, arid and with a very dry climate, receiving 200 or 300 mm of water per year, close to the sea and it belonged to big landowners. You could only see some scarce and very extensive breeding. So where you now see those intensive greenhouses, in the 50ies, there was a practically uninhabited territory, where only some sheep herds roamed. However this territory had important water tables. Therefore the Franco regime, whose agricultural policy was widely based on hydraulic development -through dams or usage of ground waters- decided to launch an irrigation project in the area. It consisted in irrigating 1500 hectares approx. and in settling down on these irrigated lands peasants that were either small peasants without land or small peasants dwelling in the surrounding mountain areas. Consequently a share of the land in this zone was expropriated and dedicated to improvement, meaning that this land was irrigated and divided into small farms for peasant families. Representatives of the IRYDIA1, a state institution in charge of settling down the farmers and suggesting them a culture system, technically coached the farmers who settled down. At that time, the proposed system was not at all about market gardening or horticulture. The technical orientation was about irrigated polyculture and breeding. The farmers were given a few cows and recommended to grow alfalfa. This system had no chance of expansion in the future. Very soon a problem occurred: the table water was highly saline. The land was located on the coast, very close to the sea and seawater intrusions occurred. The cultures did not prosper or at least they were tremendously lagging behind. The farmers then thought they had to “find another solution” and this “other solution” could be implemented thanks to a peasant technology transfer. This is very important. Since the water was saline, they needed a system that could buffer salinity. As a matter of fact, in the Malaga area, an old technique consisted of doing reconstituted soil: it was made by putting into the ground a layer of sand and inserting between the original soil and the added sand a layer of manure. Is Spanish, this peasant technology of reconstituting soils is called “enarenado”, coming from the word “arena”, sand. So it was a peasant technique that was transferred to address this technical obstacle. Another peasant technique, coming from the winegrowing in the foothills of the mountain next to the Almeria plain was imported in order to improve the system. This technique enables to drive up the wine stocks and to let them prosper on a high up latticework. This creates a kind of arch that allows the vine to expand. So the peasants thought of reusing this technique with a system of stakes and coppice and they added a plastic veil on top of those frames creating some type of greenhouses. The farmers made their greenhouses themselves, this work being based a lot on mutual assistance. Those mountain farmers who did not know anything about market gardening combined both techniques and they managed to create the first greenhouses in the 1960ies and to grow their first vegetables. Intensive greenhouse cultivation thus started in the 1960ies and remained, for 15 years a local production that was mostly sold in the area and a bit at country level. This production system was further “modernized” in the 1970es. A trigger of the industrial transformation of the system at that time was the arrival of greenhouse builder companies. From that time, the farmers were no more those building the greenhouses. The greenhouse infrastructure that I described as an initial peasant technique completely changed. From then companies were performing this building work and greenhouses were industrial. Another very important evolution is the extension of the area. The initial perimeter covered 1500 hectares approx. This was only a share of the impounded land and a non-irrigated area was still available and could be impounded thanks to the ground water. You need to realise that those farmers who had started to produce and sell vegetables showed to other farmers an image of success. This generated pressure on the land and the owners of non-irrigated parcels sold them and progressively the initial core area expanded. 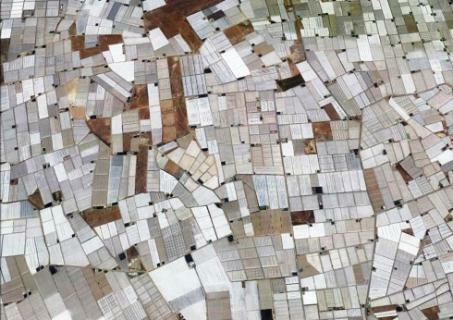 Today there are 25 000 hectares of greenhouses in the Almeria province. So a big leap forward has been made since the 1970ies. In that time the market became mainly national. The commercialization occurred through sorts of platforms where the peasants brought their production and directly confronted with the intermediaries who came to buy their products. In this method the sales were made according to a system of reverse auction. This method had been imported from the fish market auction sale that existed in the Andalusian harbours and that is called: « Alhondiga ». Prices were not fantastic but the peasants were sure they could sell their products. Additionally we should not forget that the region had a comparative climatic advantage that enabled the set up and upswing of this system. The very hot climate with almost no frost on top of the early spring enabled a privileged access to the market. The production of this area consists in early vegetables. It is very important to highlight the fact that the production of early vegetables established the access to the market. We can add another element that is central to this production system: the financing. Very quickly a local bank that had a quasi-monopoly position, the Caja Rural, provided the financing. In order to settle down you needed funds to finance both the creation of the land in “enarenado” mode, the building of the greenhouse, the manpower and you had to advance yearly cash for the cultivation, etc. This bank was very active to finance the launch of the exploitations and has been a key element of the dynamic in the 1970es. Then the extension of the system intensified after Spain entered the common market in 1986. From there the system was projected on the European markets. At that very moment Almeria got its exporting and international role and the presence of foreign purchasing centres became more and more organized. The old system that was based on a local face to face between producers and tradesmen is widely replaced by large European buying centres. The local peasants started to organise in cooperatives in order to offer an organised flow of products to buyer centres. Today 60% to 70% of the production is sold through a contractual system. Contracts are directly signed between producer cooperatives, which appear more like business companies and European central purchasing bodies like Carrefour, Auchan, etc. And trucking does the commercialization; trucks leave the area every day in order to supply large city markets in Europe, incl. Germany, Holland and England. So today Almeria is the first vegetable export zone in Europe? Is this production mainly intended for exportation ? Yes, it is the biggest European area for intensive vegetables production. Progress was very fast during the first 15 years after entering Europe. Productivity increased: in the beginning production was probably about 30 tonnes of vegetables per hectare and today it likely reaches 50 or 55 tonnes per hectare. Export is the majority but of course Spain continues to be supplied. In Almeria there is a fleet of trucks that only exists due to this business. This is another aspect of the system: if vegetables production were shut down, many transportation companies would go bankrupt. You stated that we face farming companies that are “constantly embedded in a world of technological progress”, could you be more specific about this ? While becoming international and European the system also faces the arrival of other ingredients of so-called “modernity”. Which are these ingredients? It is for example improved seeds imported from the Dutch who have a huge technical advance in this matter. Also the drip irrigation replaced the irrigation by submersion. The irrigation system has become much more controlled and the water inflow more appropriate to the needs. And things are going even further; sometimes there are sensors that calculate the humidity rate. All of this is performed thanks tomassive usage of information technologies. Some greenhouses are totally IT managed with computers that control everything. Some greenhouses are hydroponic: even soil has been abandoned while irrigation supplies water, nutrients and fertilizers together. This requires significant investments from the farmers? To what extent are they “pushed” to invest? Indeed, the bank plays an important role in the massive incorporation of technologies into this family farming. The banks press the farmers and make offers to them for equipment and increase of their productivity. There was effectively an increase of productivity that is clearly due to investment in capital, and many farmers are indebted or even struggling in some cases. Indebtedness is a reality. It is compensated by the increase of physical productivity. If you look at things from a technical point of view you can consider this is a hyper technological system. Of course there is a full range of farmers profiles, as in any agricultural system; some farmers stay away from this technological rush, and continue using older technologies, hesitate to go into debts or lack the technological knowledge to do so, while some others are at the cutting edge of technology. Behind this diversity of profiles, the system as a hole has access to techniques that are suggested from the outside. The peasants are no more the ones who improve the system and nowadays whatever happens comes from the outside, from companies that are upstream of agriculture and that say: “introduce the computer to better control this or that item and you will see things will get better for you”. Technically in the context of greenhouse forcing culture this is a high level system. This system is an example of “development” in the classical economical thinking: surface increased, production increased, manpower is important, but we will touch upon this later… The supporters of our neoliberal system consider these areas as examples. If we look at El Ejido for example: at the beginning it was a small village built from scratch for farmers who arrived in the 1950es. Today it is a city of 50 000 inhabitants! And if you go there you can see a lot of beautiful cars in the streets of El Ejido, you can see farmers driving the latest Mercedes. During the period of strong growth in the 1980-90ies people earned a lot of money. So on top of the technical aspect of this development there is also a whole territorial conception that breaks with the classical scheme of the European agrarian landscape. The farmers in this area are practically urban dwellers. On one side you have the part of the territory with the plots of land that are adjacent and on the other side the urban space where the farmers live. This place has been progressively urbanized, where you can find the services, in particular, a huge number of banks have subsidiaries in El Ejido. One can state that an agrarian landscape of “agro-city” type has been built here. El Ejido is an agricultural town, with streets and buildings next to each other. Housing is not dispersed on the land. There is a disruption between the place of agricultural production and the living place. Can we still see new establishments nowadays? Does this model continue to develop or is it decelerating? No I do not think it is decelerating, I think it is mature. There is no more extension since all available land is used. The production place is really spectacular, those greenhouses side by side with those narrow little paths, and you move inside a labyrinth, it is all very saturated. I believe in Nijar, close to Campo de Dalias that concentrates most of the greenhouses, some free plots remain. But globally the development is not made through increase of surfaces but through technical improvements, on already conquered land. In any case the system is not decelerating, not yet, because Almeria continues to benefit from its climatic comparative advantage. One can get zucchini in January coming from those areas. There are also all these companies that surround the system: seeds, IT, greenhouses, banks, and so on… so there are permanently new offers that keeps the system going. We can observe a dynamic of absorption of technology that is continuous, not to say forced, by economic forces to which the farmers almost have to submit themselves if they want to stay. We face a system that absorbs more and more capital that pushes to indebtedness and to production increase but on the other side the buyers aim at limiting the price increase as much as they can. The farmers do not benefit directly from the potential decrease of production costs because the ones who buy know that productivity has increased and they push the farmers to sell cheaper. Finally, the farmers’ profitability rate decreased under the pressure of buyers, of purchasing offices who permanently negotiate lower prices.So the farmers invest a lot but their profits do not increase, the only compensation being the possibility to increase yields. The increase of yields has been important and this enabled to compensate investments. Profitability has become more uncertain but the farmers are still here, struggling and submissive. Finally those farmers do not decide much any more? In fact they decide to borrow. Studying the Almeria system is interesting because it shows how the capitalistic system works. It is based on the involvement of people that are forced to absorb capital in order to keep working the non-agricultural part of the system, the big equipment companies, and the seed companies. Given all those pressures we mentioned, we can see the farmer trapped in a grip both upstream for the supply of means of production and downstream for the sale of production. He his forced to buy a lot of stuff while his production is purchased for little money. As a result, his income tends to stagnate or even to diminish. This functioning is typical of the development of capitalistic economy overall. We are in a sector of agriculture that is totally submitted to capital, a production system that keeps working based on family agriculture but that has been inserted in capitalistic economic mechanisms. So of course, this is becoming less and less attractive for farmers and the current average age is relatively high. Many of them started in the 80es and I am not sure the younger will take over, this is not granted… Considering this there is a question, what is the future? May the retirements will trigger an increase of the size of farms or the advent of large-scale enterprise agriculture, but for the time being we remain on a small scale. What is the average size of a farm? Did a concentration phenomena occur ? The average a farm is between 2 and 5 hectares. Some extensions occurred but it remains family enterprise agriculture. There is always a farmer there, working, hiring people, of course but he is here, on site. So it is a “modern”, capitalised family agriculture. But there has been no emergence of capitalistic companies claming: “ we will get 50 hectares, employees and we will operate this way, like a capitalistic enterprise”. There were attempts in the 80-90ies, one of which famous: “Tierras de Almeria”, based on capital and wage-earning employees but it did not succeed and it was closed down. I believe it is difficult to operate this type of system with a boss who is never seen because market gardening requires continuous attention and it is difficult to delegate exclusively to employees. I consider that the operation manager needs to be on site. May be another reason is that employing permanent manpower is expensive as there are periods without activity. This is why very large farms are few. There is a scale of difference between small farms of 1 or 2 hectares and others of 5-6 hectares. A large farm in this area has 10 hectares and there are very little of this size, the ceiling is at 5-6 hectares. Of course there are land sales like everywhere but the land market is not very dynamic. Can you touch upon the environmental consequences of this agricultural model ? First of all, in this agriculture there is a massive usage of plant protection products, that pollutes the soil and water and produces food that is detrimental for human health. Then, the overexploitation of groundwater is a severe phenomenon. They only could reach 20.000 hectares by increasing the number of drillings and get water deeper and deeper. The water reserve decreases and in the high level of ground waters, water has become very salted. Why ? Because taking groundwater fosters marine intrusion. Since overexploitation of groundwater close to the surface induced salinization, now they get water deeper and deeper, where it is less saline. So, after having depleted the higher part of groundwater, now they are depleting the deeper part. This may be the fact that will sound the end of the model. The natural resource is wiped with no possibility of renewing it and this is extremely serious. There have been attempts for alternative supplying through water coming from other areas. In any case there is an issue of resource depletion. Another consequence on environment is the waste produced by the old plastic tarp that covers the greenhouses. This is huge: tremendous amounts of plastic are stored every year. In some places one can see the plastic tarps stored in balls. But this is not always the case and you can see old tarps accumulating and rotting in the sun. There is a real and unresolved issue of waste treatment. So from an ecologic standpoint this system is far from being sustainable. There are heavy degradation effects. Can we see organic farming being developed in this area? I cannot tell what is the organic farming portion but some farms have shifted to organic, meaning they have reduced the usage of plant protection products that are massively used in this system. There is a trend but it remains marginal. We cannot say we are facing an explosion of organic farming either. Regarding manpower can you explain how this system was progressively structured with migration flows ? This is one of the most striking aspects of the system. As I told it has all started with family farmers. Families of poor farmers have been settled down in the 1950ies. When this greenhouse horticulture started to expand one found out that at some periods of the year the family manpower was not enough, especially during harvesting. Even by calling in the children and grandparents… the farmers where not necessarily able to face the needs. So they had to use seasonal workers. At the beginning they could use Andalusian seasonal workers. It lasted until the 1970ies when the possibility appeared of putting this local manpower in competition with manpower coming from immigration. At this time an immigration coming mainly from North Africa started to arrive as they found an opportunity of work in in the greenhouses. Information is circulating between immigrants, so even before crossing the Gibraltar Strait those workers knew that there were working opportunities in Andalusia, definitely poorly paid and with tough conditions but nevertheless a means of survival thanks to their work. A circuit through immigration was then initiated to provide additional manpower to the family farms at given periods. The farmers could pay the immigrants less than the Andalusians. Gradually the Andalusians withdrew from this market because they knew they would not be paid enough. Very soon the Andalusian worker was pushed out or decided himself to get out of this area. So there is a kind of informal labour market which was set up between people who had no other choice than being employed whatever the price and the family farm operators who had irregular manpower needs along the year. This confrontation between supply and demand started to work in secrecy. Everyone knew those workers where there but nothing was done to regularise them with stable jobs and legal contracts. There was available manpower in large quantities, as much as you wanted, the supply always exceeded the demand. There were always available workers around the greenhouses; the employer did not need to bother, he knew he would find the needed workers the evening before. This informal labour market has been working for years and is still up and running today. Can you please tell about the working and living conditions of this workforce ? The conditions are despicable, the work in the greenhouses is very hard, heat is unbearable and the workers breathe chemical products. Furthermore, they do no know if they will be working 8 days or 3 days, they can be dismissed from one day to the other. And of course the working hours are very poorly paid, in practice the employers always offer lower salaries than the ones defined in the collective agreements of the district. Also the living conditions are dreadful. Those people arrive without anything, they live directly in the greenhouse areas, some times in old buildings, the « cortijos », the stables, that remain from the past and can serve as makeshift housing, or sometimes they build shelters themselves with old plastic tarps. They dwell in total discomfort, in what we should call barracks rather than housings. Some of them, who stay long time, finally manage to obtain an accommodation in town but this is not easy and even if they get this, it remains bad housing conditions. On one hand we have the workers that face terrible working conditions, are poorly paid, have no job security, no housing and on the other hand we have the employers that have a totally banal practice of capitalistic entrepreneurs, adjusting the employment in their farms to the needs of the time. The farm managers exactly know how much manpower is needed during a given period and will then draw on the offer that is overabundant. The labour market is totally unbalanced to the benefit of the employer. This is the asset of the Almeria employers: the fact that there is a manpower tank from which they can draw any time. This configuration of the labour market is the ideal that all capitalistic companies look for: to have nearby a ready to use manpower from which they can draw whenever they need. This permanent option of adjustment allows the entrepreneur to calculate his needs very scantily, and he does not care about what happens to the worker once he has been told to leave. There are practically no permanent employees. Those small farms of 2 to 3 hectares operate with a manager and seasonal employees, roles that were formerly fulfilled by the family manpower. This is how the market works. This is a “secondary” labour market, a marginal market where two categories of actors meet, having behaviours we could call unfortunate regarding the employees and shabby as far as employers are concerned. Nevertheless it forms a whole that is structured even if informal and clandestine. Can you come back to the successive waves of arrivals of immigrant workers and their various profiles? As I said earlier, during the first period, in the 1970ies they were Moroccan immigrants, the close neighbours who came but did not necessarily stay. This was a relatively organised immigration; whole families came from Morocco for the harvest season, returned to their country and came back the following year. In the 1980ies the Sahelians arrived; this complicated the situation because those ones stayed the year round, they could not go back to their country between the seasons. Their initial objective was not to stay in the greenhouses region, the idea was to leave after having earned some money. Generally they stayed for one or two seasons and left to continue their immigrant journey in Europe. The work in the greenhouses was a temporary position, a bridge. A bit later, in the years 1990-2000ies, a new immigration was added with people arriving from Latin America. And nowadays there is also manpower coming from Eastern Europe. Due to the enlargement of the European Union Romanians, Bulgarians and Polish got the opportunity to perform this drudgework. In the East European countries case, we mainly can see contract made at the origin which consist in hiring the workers directly in their countries, in Romania, Bulgaria and Poland… This system works in another intensive agriculture area of Andalusia, the strawberry production area in the Huelva province. This does not mean that the conditions are better, but they are known upfront. Legality does not mean less exploitation, the working hours are still poorly paid. The employer is committing on the paper, he can easily write that “ the workers are correctly accommodated” but first, the word “correctly” is not defined and second, there are no controls. There are very few controls, the state shuts its eyes and there is a kind of acceptation of the situation. The strawberry harvest in Huelva is very feminized, while in Almeria manpower is mainly masculine. In the Almeria region people from East European countries are a minority, the majority are Africans, mainly Sahelians, then come the Moroccans, which are still numerous. Considering the original social environment of those immigrants, initially they were fundamentally a rural peasant population, mainly Africans. But there are also many immigrants that come from middle classes who studied in their country, who achieved a university level but have no future in their country; the ones that emigrate are not necessarily the poorest. There is a diversity of profiles. We also have the category of immigrants that settled down for long time, which are regularised, who stay a couple of month for the seasons and get back home the rest of the time, in particular the Moroccans. Generally these ones have a stable relation with an employer who will hire them each year. So this system could not persist without the availability and exploitation of an immigrated manpower? Indeed pressure on salaries is the adjustment variable of this agricultural system. Increasing the salaries would make the region less competitive, or even not profitable at all. Because there are other regions growing this type of vegetable, Almeria is not the only Mediterranean region that produces early vegetables, competition exists, in Greece, Turkey, Morocco, … based on the same system of exploitation of seasonal workers. I visited a region in Turkey were tomatoes are produced also in greenhouses. They had a Turkish and Romanian feminine workforce that is paid very little. The cost of manpower in that zone was lower than in Almeria. In Almeria, even though the situation is very bad, the Sindicato de Obreros de Campo (Agricultural Workers Union) is present and active trying to defend the immigrant workers, as well as a couple of NGOs that care for the workers situation and their living conditions. This nevertheless creates what we cannot call a pressure, but an attention paid to those people. Due to this, in the very last years, there has finally been an improvement compared to the 1980ies. While, when looking at the situation of the Romanian women working in Turkey, I can tell you nobody is paying attention to them and they receive extremely low salaries… So competition is international, because workforce exploitation has not limit. How does the local Andalusian population perceive those immigrants? One could hear already about racist conflicts incidents. In Almeria, the number of immigrants is significant, there must be permanently 20 000 immigrants in this region. They are present, visible and the native population, the Andalusians, developed an unbelievable racism in the province. There is a very strong latent racism that is not often expressed through visible incidents but in the early 2000es, a conflict broke out, especially in El Ejido2 with clashes between Andalusians and immigrants. Generally there is a latent presence of racism, everybody keeps to himself, but conflict may break out. This very strong racism is paradoxical because if the Andalousians in this area have flourished it is only thanks to those immigrants but they do not acknowledge it, as often. There is an evident hypocrisy.